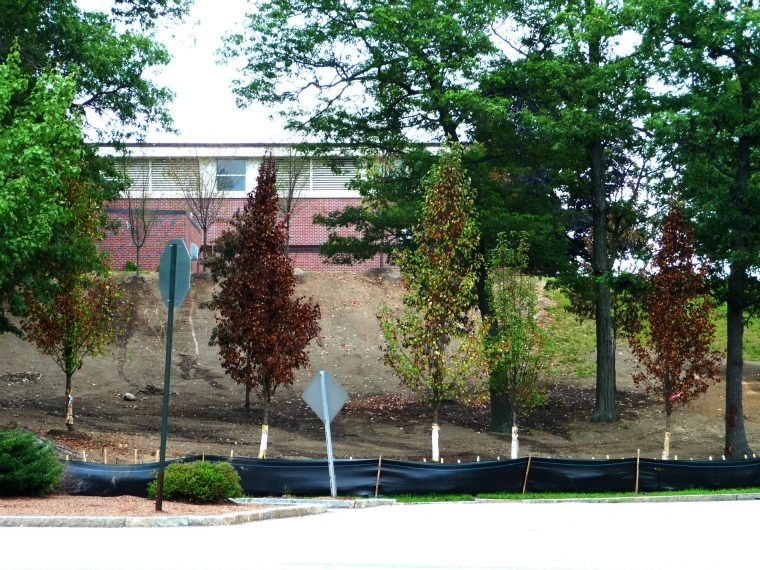 This past week I had occasion to pass the same suburban Massachusetts middle school on two days in a row, and on each of those days my eyes goggled at the sight of a new planting on a slope facing the road. The array of brown, grey, and coppery-red foliage — on the trees that still had foliage — was stunning. From what I can tell, over the last month or so more than thirty new oaks, zelkovas, and pears were planted as an understory to a mature oak forest. Did I say stunning? Yes — but not in a good way. Most of the trees are dead, and it’s likely that within a few weeks the few still hanging on will die. You have to admire the forward thinking that gets a new stand of trees started while an existing stand remains; it’s a principle used more in European landscapes than American ones, and we could stand to practice it more here. It really makes sense to extend one’s planning horizon beyond the span of one’s own life and think both in terms of tree longevity and of the needs of generations to come after us. The idea of getting young trees established under a mature stand seems particularly apt at on a school property, where adults are fostering the growth and education of children, and tending the young beings who will one day assume adulthood. So the failure of this planting, installed with apparently the most admirable of motives, seemed especially poignant and distressing. The tree species selection seemed fine, but it looked as if almost every other element of a planting — root ball size, soil quality, well construction, mulch used (or lack of it), and watering — was inadequate to fulfill the aim of establishing a planting that would live and thrive. It was impossible to miss this planting from the road below. Virtually every newly planted tree is either dead or nearly so. From the school drive above the slope, the view is as disappointing. The pears look like the toughest of the new trees out there. Fall color in July is never a good sign, but at least they still have leaves. The zelkovas are mostly bare. That pile of soil in the foreground is the native soil on this New England upland slope, thin and sandy, with little organic material evident. 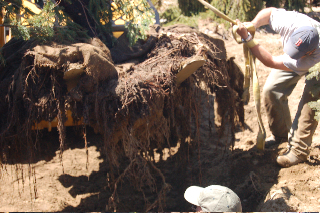 It appears that the new trees were planted directly into this soil without amendment -- which is fine, as long as the planting crew worked on the root balls to make a rougher interface between root ball soil and native soil. 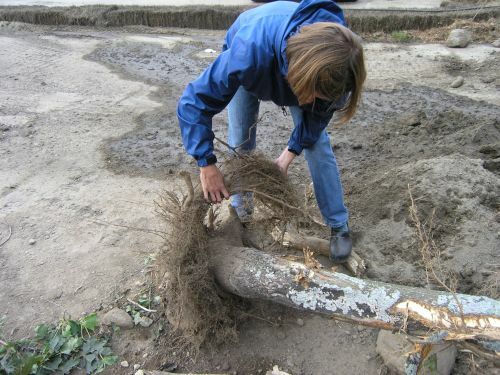 Because water will only move from soil of one porosity to another when the soil is saturated, and roots follow water, you want to scuff up the walls of a root ball to make a less distinct interface between the two soils, and to encourage water and roots to cross the interface. Another tiny root ball, with a mini-well. The well is very loosely constructed; water has broken through and run down the sandy slope, leaving the tree high and dry. This photo makes me thirsty. All of the trees are planted on sloping ground, but hardly look it -- another indication that root balls and water wells are too small. Got mulch, anyone? 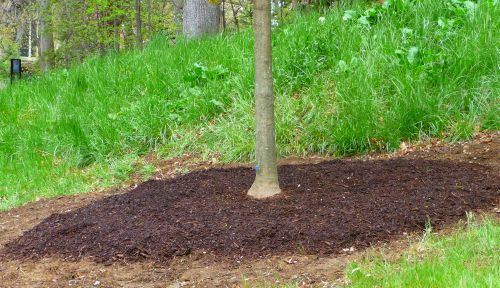 Particularly in this type of sandy soil, a watering schedule and at least a temporary irrigation system (set up to last and run through the first growing season) would help establish the trees. Planting like this has consigned what were once good trees to the chipper. Egh. More of the same. What good can be said of this planting? Well, again, the idea of starting a new generation of trees in an established stand is an admirable one. The tree’s root flares appeared to be in the proper relation to the surface of their root balls. Otherwise, it seems to me that this planting is a cautionary tale: against contractors who do not know how to plant properly, against too-small root balls, poor soils, substandard planting practices, bad tree wells, the absence of mulch, inadequate provision for watering, and inadequate watering itself. The information on how to plant and foster trees is readily available, so the question may be how do we broaden people’s awareness of it, and their awareness that trees are living organisms rather than tall pieces of furniture? Any ideas? I took a great class this past January at the Arnold Arboretum. 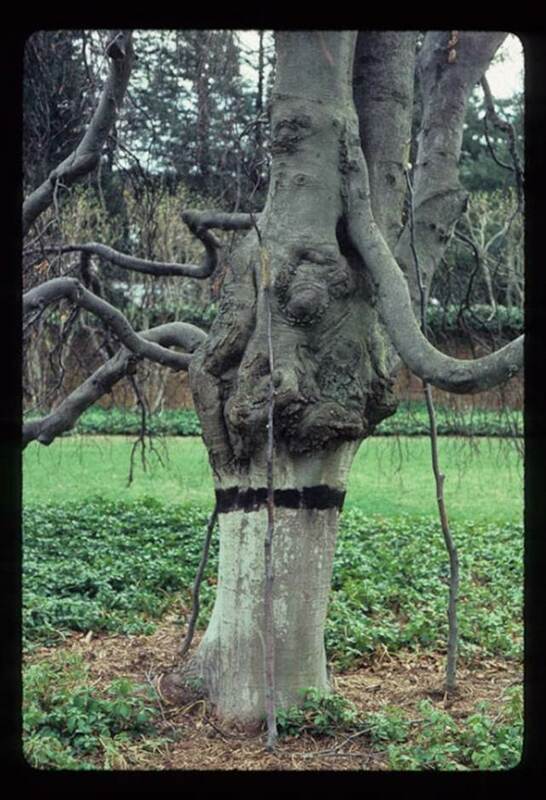 It was called Grafting Techniques for Ornamental Trees, and was taught by Jack Alexander, the Arboretum’s Plant Propagator. Jack, who is not only an extremely talented plantsman but an excellent teacher, taught us how to prepare cuttings, how to make several different kinds of grafting cuts, how to fit scion and root stock together, wrap the graft point with an elastic band, and then wrap the whole shebang with Parafilm. Anyway, at one point during the daylong class Jack had us take a break from grafting and showed the class some slides. Among them were shots of a grafting project that he had been commissioned, privately, to work on some years ago. 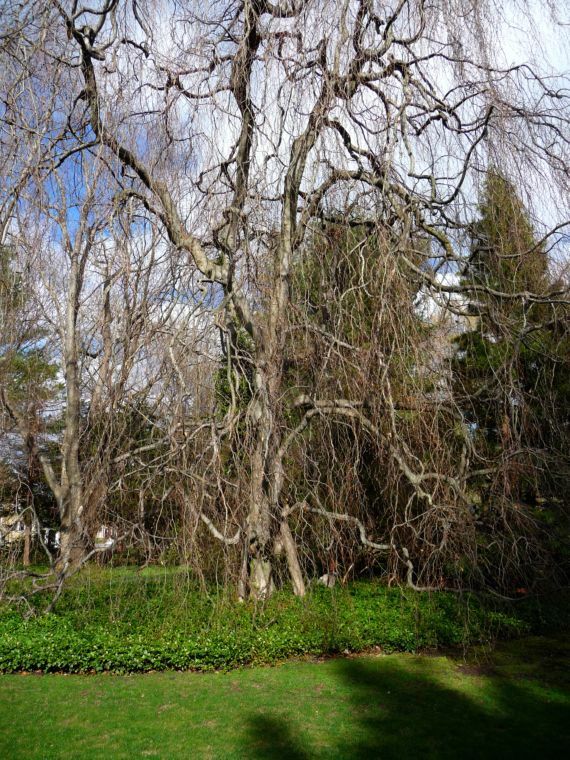 The tree, located on a property outside of Boston, was a 40-50′ high grafted weeping beech. 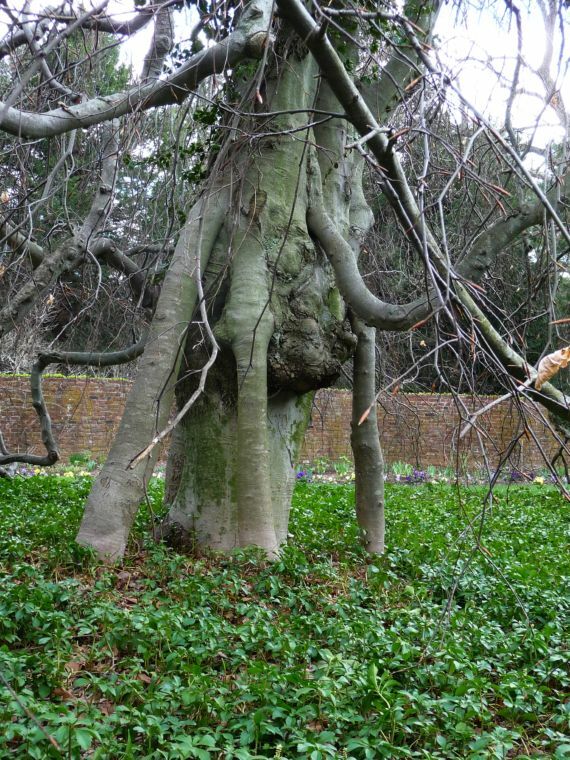 It had been top-grafted at a point about 5′ from grade; the trunk below the graft point was about 30″ in diameter, while the trunk above it was considerably larger. Hartney Greymont, Inc., arborists in charge of the tree, had noticed flagging in the tree’s canopy in 1984. 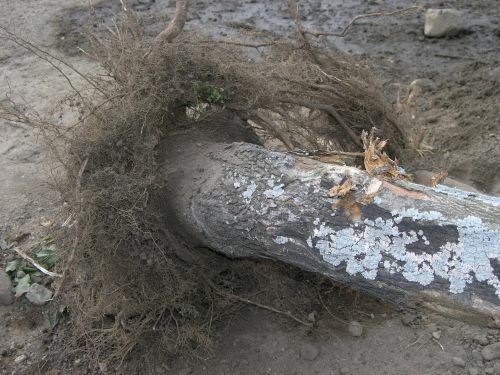 They hypothesized that the roots could not get enough water up through the constriction to the tree’s crown, and that photosynthate was accumulating above the graft point. They called in Jack Alexander to do some grafting that could help improve the situation. The problem: Constriction at the graft point was retarding the flow of water up to the tree’s canopy, and possibly preventing photosynthate from flowing down to the roots from the crown. 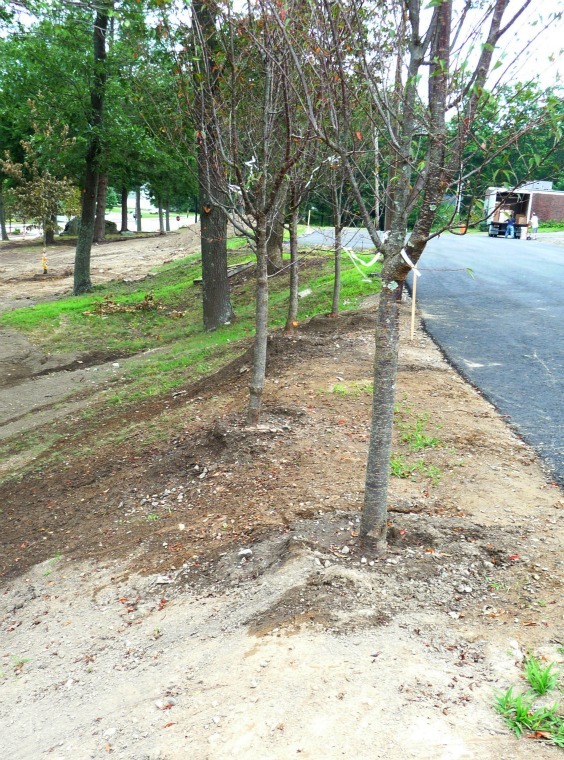 The solution: Remedial grafting, using four beech saplings to create supplemental trunks. The process: In the fall of 1984, Hartney Greymont planted four 2-3″ caliper (3/4″ dbh) beech saplings around the tree, evenly spaced from each other and about 3′ out from the tree’s trunk. The saplings settled in over the winter. Jack, who had the experience and expertise to work comfortably with such a valuable tree, then grafted the tops of each sapling to the trunk of the specimen beech above the graft point. This process is called inarching. Jack believes he performed the grafts in April of 1985. The newly inarched beech, with three of the four saplings planted and grafted above the beech's graft point visible here. Matching the cambium of the saplings to the cambium of the mature tree allows photosynthate from the tree's crown to flow down the sapling trunks, supplying them with nutrients that otherwise would serve to overenlarge the beech's trunk just above the graft point, making the tree more susceptible to failure. The inarched saplings make a conduit for water to flow upwards into the canopy from the roots as they benefit from the abundance of photosynthate, and in turn enhance the tree's stability. Photo Copyright © 1985 Jack Alexander, used by permission. The following year, one sapling had died, so Hartney planted another, and Jack grafted it to the tree in the spring of 1986. A total of four buttress trees now help support the specimen tree. The result: Photosynthate flows down from the tree’s crown through the constricted graft point, as it always has, but it also flows down through the four inarched saplings. Because the saplings are being nourished by the mature crown of the specimen, over the last 26 years they have come to serve as living buttresses to the mother tree. A few weeks ago, in late April 2011, Carl Cathcart took me to see the beech. The house had been sold since the beech had been buttressed, but the current homeowner was kind enough to let us see and photograph it. Here are photos of it as it stands today. It was wonderful to see this behemoth and to read its character, especially knowing its history. 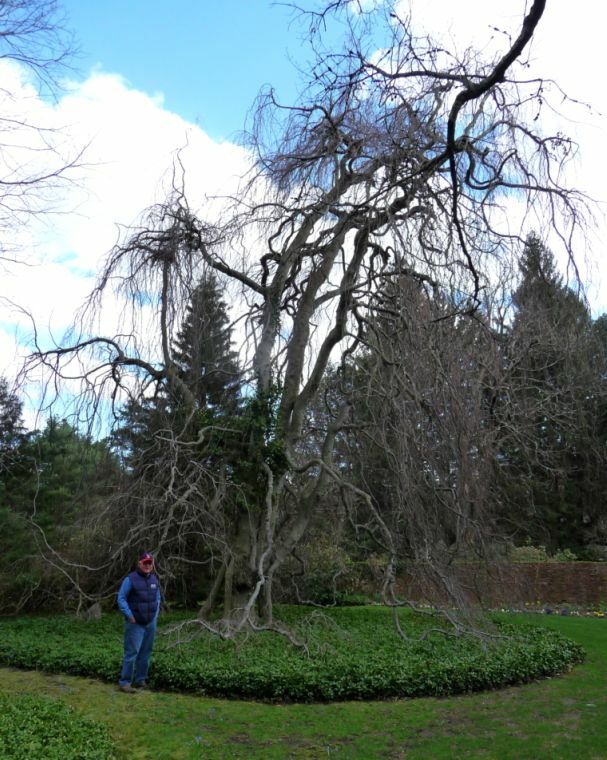 Carl Cathcart with the inarched specimen weeping beech. The beech from a different angle. What look like elephant legs under the tree are the ingrafted saplings that have now become living buttresses. Three buttresses are visible in this image; the smallest is about 6" dbh. This photo was taken from about the same point as Jack Alexander's 1985 photo. When I sent the photos to Jack, he wrote ” It’s nice to see these pics. The tree seems like an old friend.” You can see why — this is a tree with personality, and Jack did some remarkable work with it. Arborist in charge: Hartney Greymont, Inc. Yesterday I swung by the site where Herbie, the American Elm in Yarmouth, Maine, had stood for over two centuries. Herbie was taken down last January; to read the tale see this post, and to see photos of Herbie’s stump, click on this link. I hadn’t planned to stop and see the stump — what more could be said about a stump? As the exit from Rte. 95 neared, though, I wondered if anyone might have put up any signs, or even if some of the woodwork from Herbie’s wood might be displayed on the site. It wasn’t though, and in fact all that remained of the stump was an area, approximately 12′ x 18′, of wood chips. Herbie’s stump had been ground. 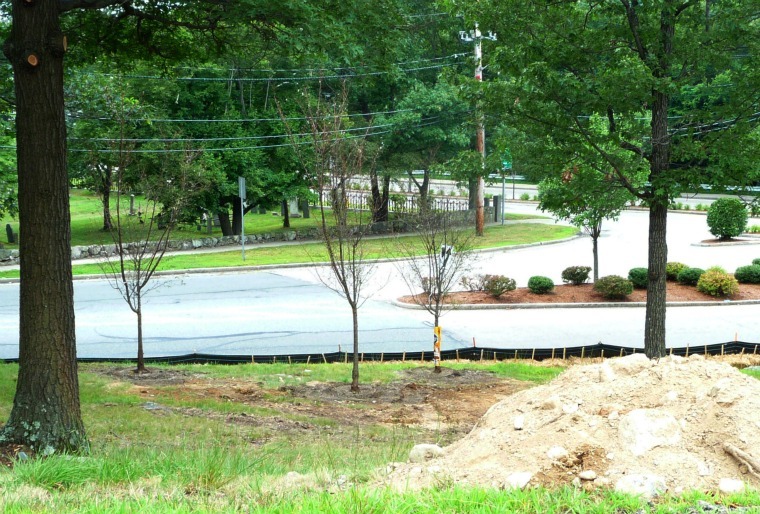 The adjacent road has been undergoing repaving, and stakes and markers dot the roadside and the edge of the chipped area. We’ll have to wait and see what takes place now where Herbie once stood. All that remains are wood chips, an open space, and a view of the utility pole. Last year I worked on a large mall planting project. 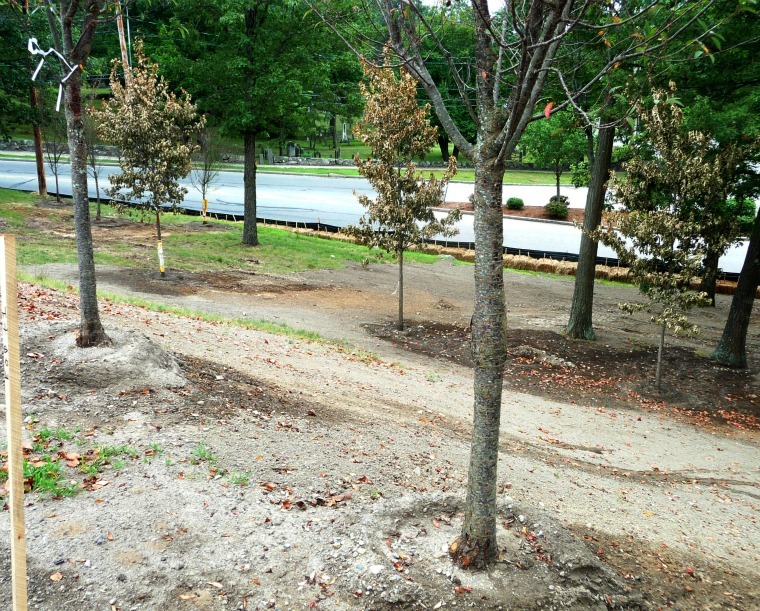 A number of trees had to be pulled out to make way for a new parking layout; the islands they had been growing in were removed and paved over, with new islands located in a different configuration. Most of the trees were hauled away by the landscape contractor, but one ended up in a discard pile next to the mountain of loam that had been excavated for reuse. Fibrous roots circling the six-inch red maple trunk. 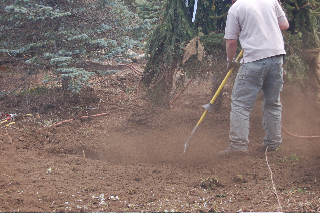 This sort of circling root is usually seen when the soil mass in a B&B root ball is of different porosity from the soil surrounding it; moisture will not move from one soil mass to the other until one mass is completely saturated. Because roots tend to grow where moisture and oxygen are available, they will often stay within the root ball, and circle around the trunk as they grow. The problem is made worse when burlap is not pulled away from the ball, as the burlap constitutes yet another interface for the moisture to move through. Here's the tree's underside. 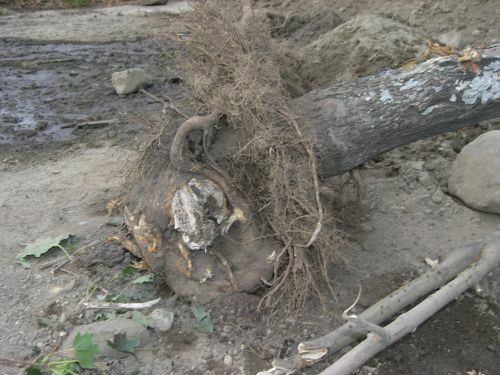 Note the girdling root snaking on top of the big torn root facing the camera, and the curiously self-contained look of this root mass. The tree's problems likely began early in its life. 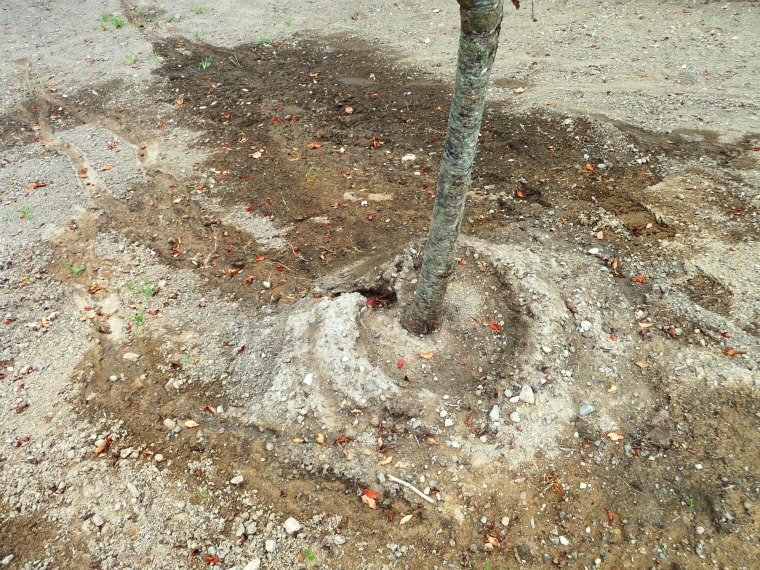 Not every B&B tree has these problems, and in those that do, not every rooting problem can be remedied at planting time. Judicious treatment — looking for circling roots that can become girdling roots, cutting back girdling roots and cutting or redirecting circling roots, roughing up the sides of the root ball, removing or cutting down wire baskets, pulling down or removing burlap — can go a long way in helping B&B trees establish better in the landscape, and in remedying problems that threaten a tree’s long-term health and viability. 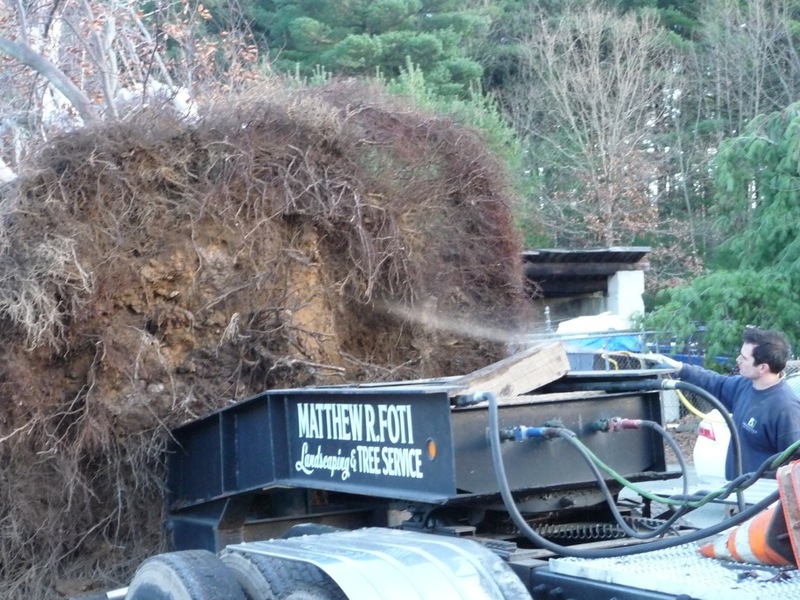 For more discussion on root issues affecting B&B trees, check out this post on Matt Foti’s station at the MAA’s Elm Bank bare-root workshop in September 2009. Mark Smith, construction project manager for Belknap Landscape Company in Gilford, NH, sent me photos and a description of the air-tool transplant his company executed with Piscataqua Landscaping recently. 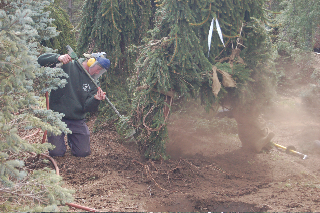 Belknap has been using air tools for transplanting, site preparation (excavating roots at foundation limit lines prior to the foundation excavation), and root forensics, and has also used compressed air to reduce weight in larger B&B-dug root balls being moved. 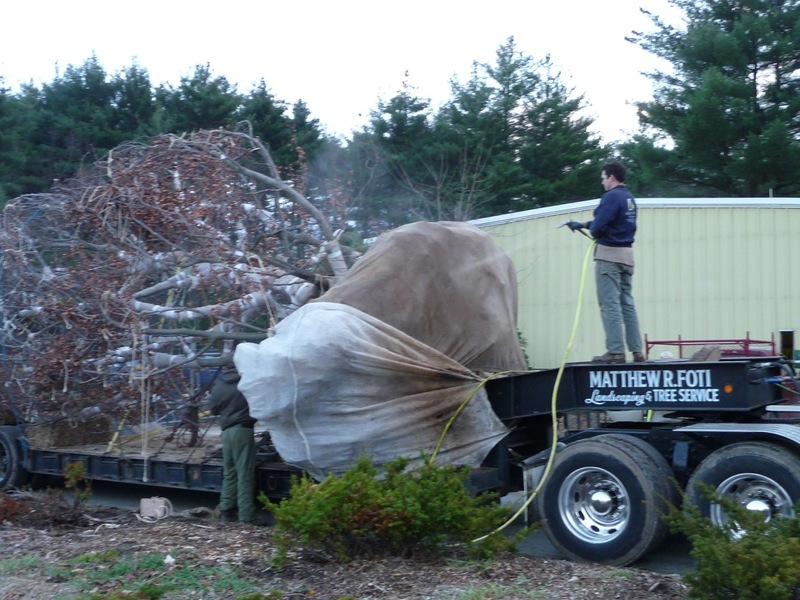 “We moved a 25+ year old Weeping Norway Spruce that has resided in Baker Valley Nurseries in Rumney for the duration of its life. This tree stood 10-11 feet tall and at least 12 feet wide on one direction. The last time this tree was root pruned with a spade was 10 years ago. 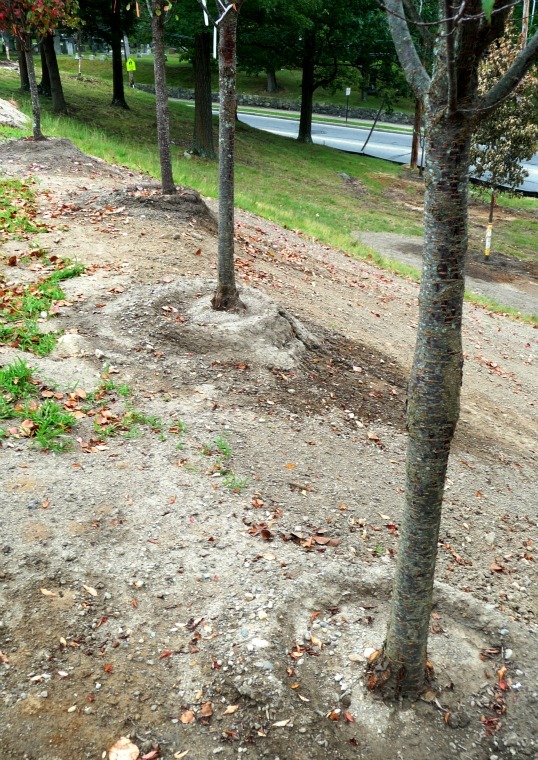 Through the spading process we could clearly see where this root pruning occurred. All said and done we were left with a 25-30′ wide root system…You cannot see that in these pics real well, as we had all the roots coiled up into harnesses and sitting atop the root pan. Branches tied back to permit easier blowout. 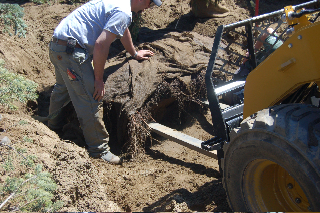 Leader wrapped in burlap to protect it during excavation and moving. 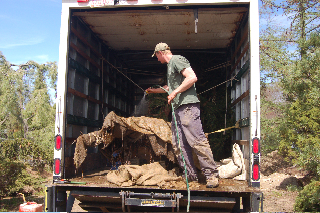 Root plate covered in wet burlap for the pickup and move. Guiding the forks for the lift. Confirming a balanced and firm placement on the forks. A final spray-down before transport. No photos yet of the tree in its new location, but when they come in I’ll post them. 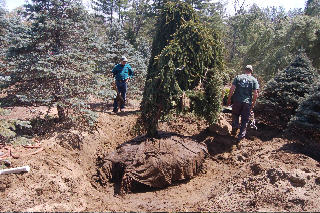 Last week I drove to Wellesley College to see the Dwarf Alberta Spruce that Jim Doyle and Don Garrick had moved bare-root last November. Fritz Hoffman, an Alaska contractor in town to learn about bare-root transplant work, accompanied me, and we walked and walked along the lakeshore looking for the Spruce. Well, it wasn’t there. We turned around, backtracked along the pathway, and came upon a grounds crew working on a plaza installation. 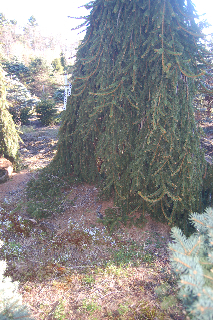 We stopped and met John Olmsted, Manager of Landscape Operations, who told us that the Spruce had died. 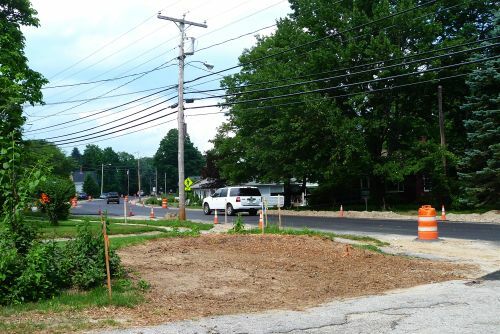 He said that despite its loss, the arborists had recently transplanted a Sugar Maple, two Kousa Dogwoods, and an American Smokebush bare-root. The Dwarf Alberta Spruce didn't make it, but this spring-transplanted Kousa Dogwood may well thrive in this spot. 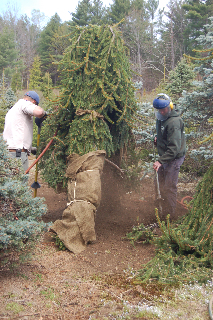 Later, Jim Doyle told me that he thought they had moved the Spruce to a too-exposed location. It seemed to fare well through the winter, but in March had turned brown and had to be removed. We speculated that the move from a very sheltered spot to an open waterfront location might have placed too high a demand on the plant. It might have survived the dangerous phenomenon of frozen soils and warm air had it been wrapped in burlap, but it’s impossible to know. Nice trunk flare on the newly transplanted Sugar Maple at Wellesley College. 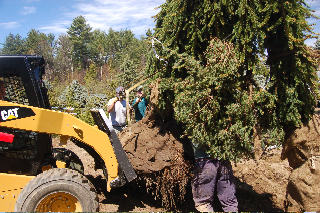 What is heartening is that the Spruce move came about because Jim and Don took a chance — and though the risk didn’t pan out, the College believed in the possibility of success, and authorized the bare-root moving of four more plants. 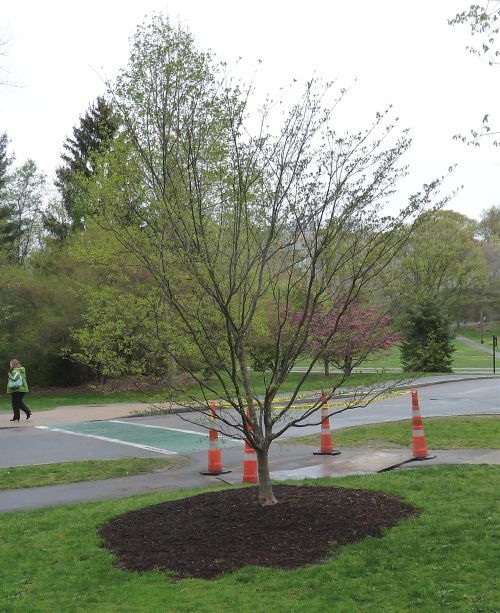 When it comes down to a choice, especially on a large campus, between moving or destroying a tree, the opportunity to move and save the tree may make sense. Actively managing a landscape — especially one with valuable mature trees — requires this kind of decision-making, and newly available technologies can give greater flexibility in the move-save debate.